Have you ever seen, right in front of your car, a person crossing a road crawling on all fours? As an expat or a foreigner traveling in alien lands you get lots of opportunities to get into trouble. Some trouble is more fun than others, but it’s wise to keep an eye out for signs and warnings and to pay attention to whatever the locals tell you. I’ve gathered some photos here that should give you some idea of what to look out for in some of the countries I am familiar with in one way or another. If this is helpful to even one person, my efforts will have been worth it. While on the island of Phuket in THAILAND, where trouble found us in the form of an ear ache afflicting our number two daughter (see: EXPAT CHILD IN PAIN: HUNTING DOWN THE DOCTOR) we were careful about the medicine we were given by a sleepy doctor wearing shorts and a Micky Mouse T-shirt. There was more trouble to be found as you can see on this sign, but fortunately we managed to avoid running over an inebriated person crawling across the road. I should clarify that Phuket Island is a tourist place, and the people ending up on all fours are usually not the locals. COSTA RICA is a beautiful country with lovely, warm people. Only sometimes apparently they get too warm . . . In restaurants, parks and other public places you’ll find signs like this: Amorous scenes forbidden. In other words, no smooching here! In GHANA, West Africa, where we lived for a number of years, we had a bar in our neighborhood, the No. 1 choice for many. It was a lively place. Lots of good fun, loud music, lots of beer. Still, looking at the sign, you should ask yourself, do I really want to go to this place? If you’ve brought along your beloved dog to my native HOLLAND, you’ll want to pay attention to the sign on the photo below. My people are known to be a practical, down-to-earth lot, so this sign is graphic and to the point and needs no words in any language. In ALBANIA where I spent a short time living in an upscale apartment in the snazzy downtown area of Tirana, a sign on the inside of our front door warned us we’d better be quiet as a mouse or else! It made me wonder what warning was posted on the doors of less fancy apartments. And last but not least, expats beware of what the natives may do to your children! You may not recognize your own flesh and blood when they get done with them. Here a photo of what happened to my number one daughter in INDONESIA when invited to partake in a local fashion show. She’s in the middle with two of her friends, a Dutch girl (right on photo) and a German girl (left). All three Caucasian blondes. Tell me what fun, interesting or scary signs or warnings you have come across in your travels. I’m waiting! I enjoyed reading this post!! I’ll have to dig deep into my “coffer” to find those hidden gems. I know I’ve encountered some funny ones in the Philippines! Oh, I love those signs… And the one about drinking beer in the Puky House seems very appropriate! I saw it everyday on my way to work and it never failed to make me smile. These signs are really hilarious. In Okinawa, home of the largest concentration of centenarians, we have “Old people” crossings which show a person bent over and hobbling with a cane. – I can’t control laughing. OMG!!! I’ve always loved the sign that you can find everywhere in Britain: take care, elderly people crossing. 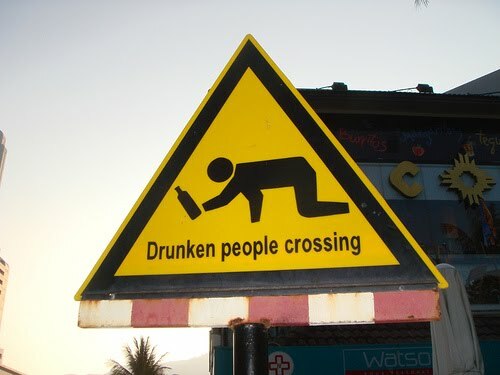 They tried it in the Netherlands, but within a week several of those signs were stolen!